This is ICLR.net, the website for legal sector regulators. The site has two parts, a public area and a private members’ area. The public area has information about legal sector regulation under Research, and information about our conferences. The private area is called the Regulator Community. This area is for people involved in legal sector regulation. You need an account to use this area. If you are invited to join ICLR.net, the site will send you an email giving your username. 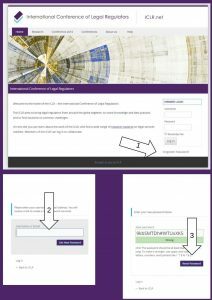 You visit www.iclr.net and click Forgotten Password (1). Give the site your username, click Get New Password (2) and the site will email you a link. When you click this link it will set up a new password for you. Save the password securely, click ‘Reset Password’ (3) and then you can log in. Please check the FAQs below. If they don’t help you, use our contact form and we’ll get back to you as soon as possible.